Sanctum Music Conference is a series of events designed for professionals of the electronic music industry to adopt experience and share knowledge between Western Seniors and evolving Asian scene. Presented and hosted by Sanctum in association with The Inventory and Beatworx Studio the first event will take place on the Monday, 15th of July, 8:00 pm onwards, featuring famous DJ, producer and Kaato Music label owner – Björn Wilke from Germany. Sanctum Music Conference will shift its focus from production technologies and techniques to highlight the surrounding network of businesses involved with restaurants, bars, clubs, nightlife and festivals, who are into event production. Restaurants, Bars, Clubs, Festivals & Events Production, Record Labels, Booking Agencies and Studios are essential tools and platforms of connecting music with its audience. On a foregoing Sunday, the day before the convention, Sanctum will premiere a ‘Kaato Music Night’ with an extra long set by Björn Wilke showcasing the best music from his exclusive portfolio. In support of the event Sanctum will also be releasing its first mixed CD compilation with exclusive rights from Kaato imprint. Our own PRAVEEN ACHARY and AUDIO UNITS are 2 of the speakers on the various panels of the conference. The prestigious MTV VMAs were launched in USA in 1984 and have often been called the ‘Oscars for youth’. Finally launched in India this year 2013, the awards highlight the best of Indian music talent. We are happy to announce that KOHRA aka Madhav Shorey is the only electronic independent artist nominated for his EP, Dust Particle (OUT ON Qilla Records) in the category ‘Best Indie Artist’ 2013, where he competes with other major commercial acts. TO Vote for him , simply visit http://mtv.in.com/vmai/nominee.php?catid=8 or TWEET #ivote4kohra as many times as possible! 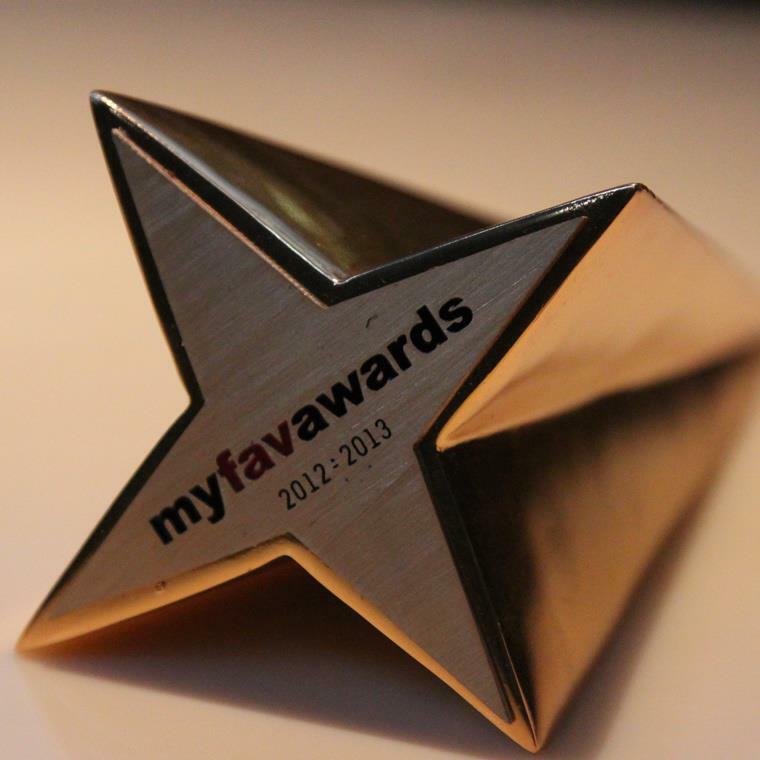 The annual MyFavAwards took place earlier this week at the blueFROG, Mumbai. A registered intellectual property, MyFav is an initiative of 360 EDGE. It aspires to recognise the best DJs/Artists, Clubs & Bands across all genres in India. The who’s who of the Indian dance music industry were in attendance, along with a surprise visit by none other than TECHNO maestro, RICHIE HAWTIN! Arjun Vagale picked up not one, but TWO awards, BEST INDIAN TECHNO DJ of the Year and BEST PRODUCER OF THE YEAR. Other nominees also included ASH ROY and TUHIN MEHTA. 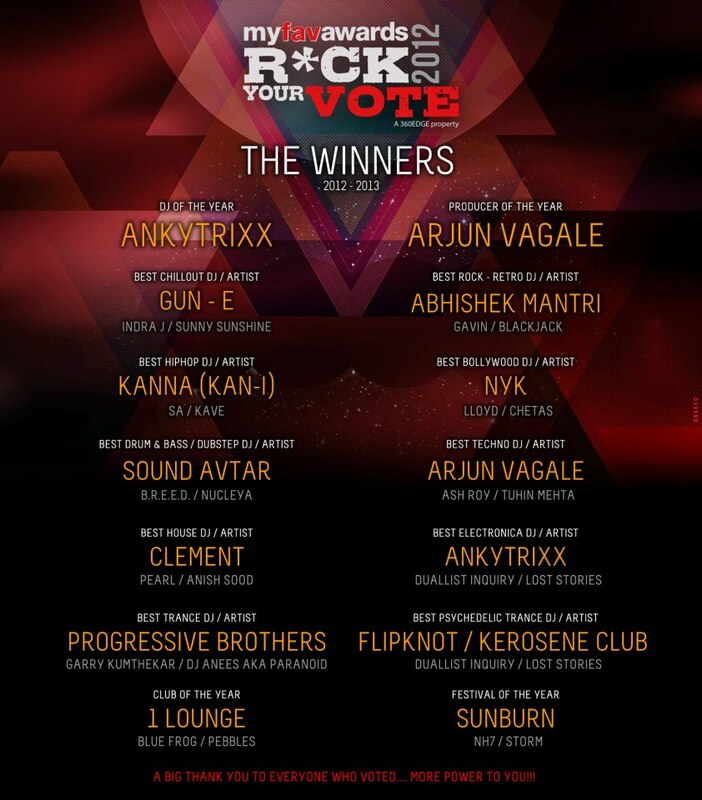 Notable winners were SOUND AVTAR (Best Indian DrumNBass / Dubstep DJ), ANKYTRIXX (Best Indian Electronica DJand DJ of the year) AND SUNBURN (Best Indian Festival). 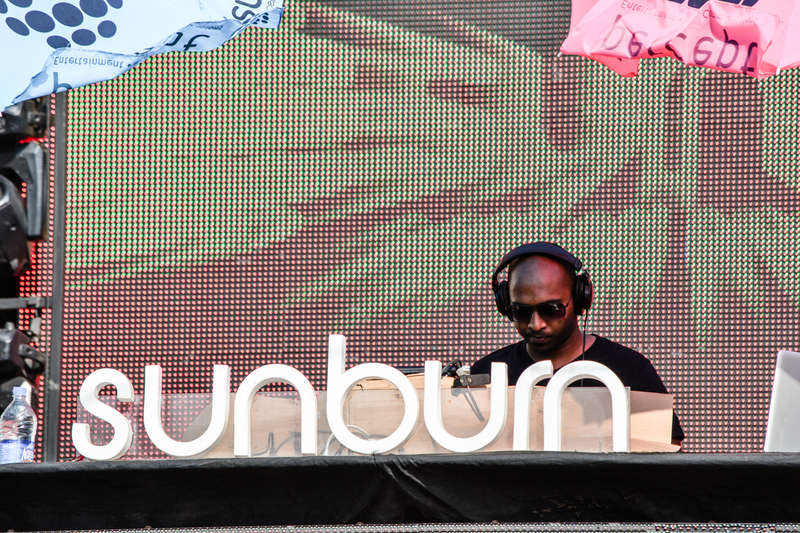 The evening led up to a fantastic after party with sets by Boombaba, Ankytrixx and Arjun Vagale. Have a look at the full list of winners and nominees here! BIG CONGRATS to everyone who won. Have a look at a few more pics from the night here! Richie Hawtin with the winners. UnMute artists BLOT! are cofounders of India’s biggest design festival, UNBOX! The latest edition is here with its brand of eclectically diverse evenings that see a fluid amalgamation of music, sub-culture and media. All evenings are free entry, the bar is affordable and the venue (Zorba, MG Road, New Delhi) is great! The festival kicks off with Sounds of Bengal – a collaborative project between the inventor of electro-acoustic sarod, Soumik Datta (UK) and Arif Khan (Kolkata). Followed by Unbox’s signature experimental session – New Culture Mash Up featuring festival curators, BLOT! + Nucleya stirring things up in an audiovisual mash-up supported by Pinksoda aka Smriti Chowdhary, who’s the mad brain behind some of the videos and Busride or the artist formerly known as Ayaz Basrai, who will be doing live sketching. Puma Loves Vinyl is a concept that presents a return to an older state of sonic happiness with electronica stalwarts from the Indian scene joining forces with Ron Schneider (Germany) – a hardware genius with a penchant for analog synthesizers. Kohra – rated no. 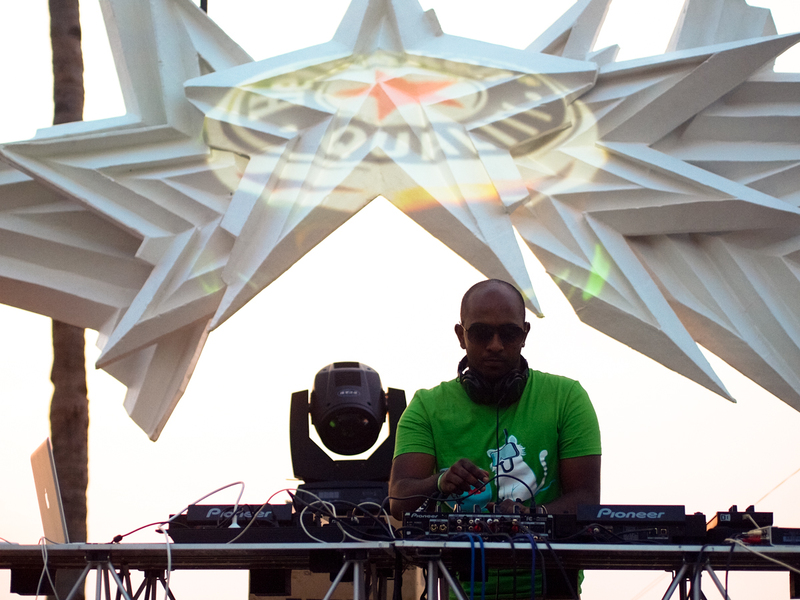 3 DJ in India last year, he returns to his vinyl roots with a medley befitting UnBox. 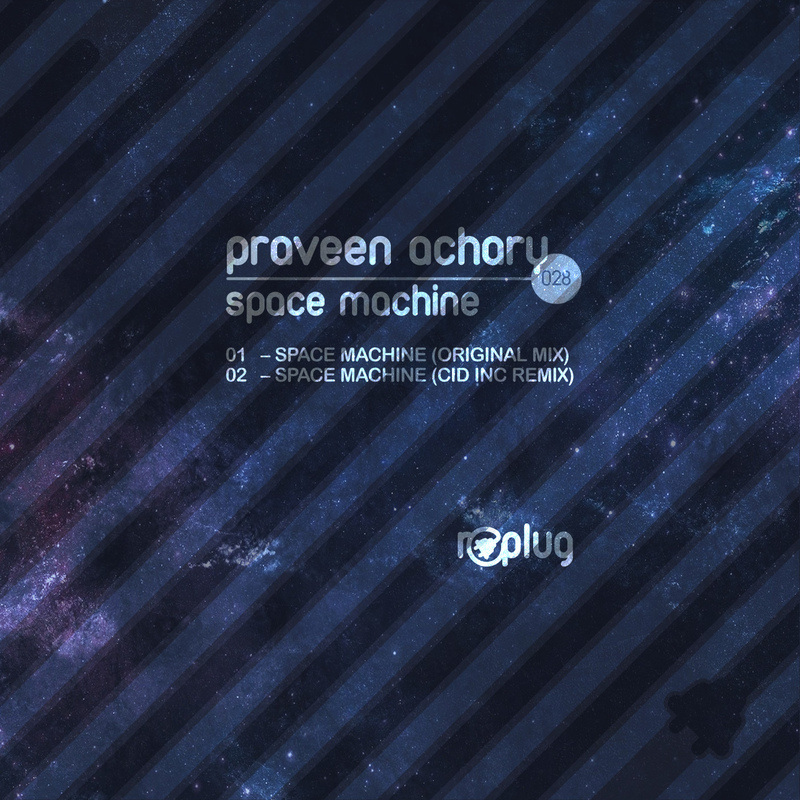 Expect good old Shpongle with spattering breaks and downtempo grooves. Vinayaka – the understated yet influential producer from the south showcases a progressive and sometimes unpredictable process of field recordings and sampling. UnBox ends with a double header. While Indian Ocean will play for a fundraiser from 7-9pm with a donation based ticket at the gate, SoundCamp – one of the labs at UnBox will present an ensemble of artists from 9-11pm. One Of Sri Lanka’s leading DJs and composers, Asvajit’s sets are intense and fast paced, blending funky grooves with techno. 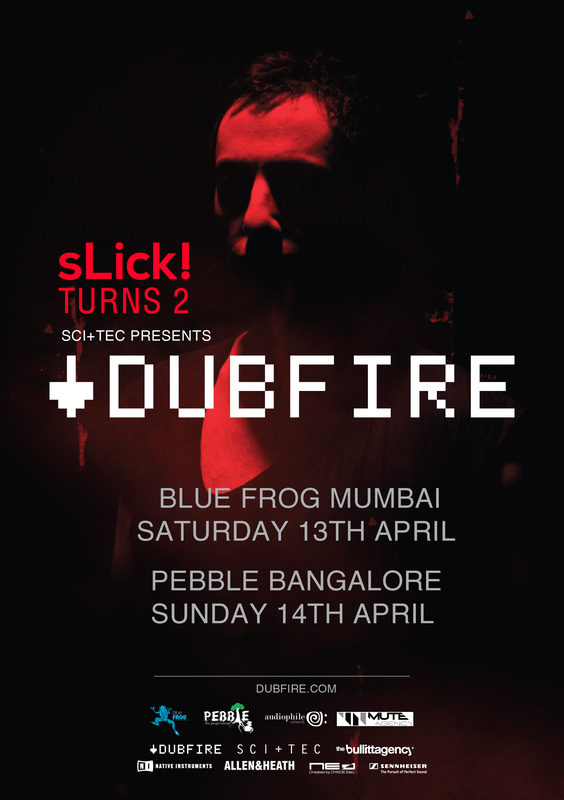 Gaurav Malaker is a musician, DJ and producer and one half of BLOT!’s live audiovisual act. Ron Schneider is a self-taught artist based in Berlin exploring the correlation between sound and technology. Bouncing between 2-step, future garage, post dub step and experimental electronica, Sandunes live set includes a range of controllers and instruments. A singer-songwriter, keyboardist, producer and composer who has toured several international jazz festivals in Asia and Europe.